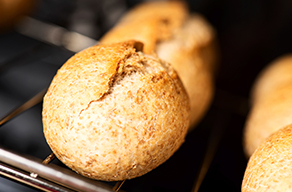 Everything you wanted to know about baking bread & rolls! People often add too much flour to dough, and this makes the finished product heavy and dense. 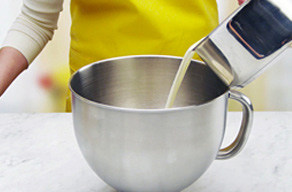 Hold back about 1 cup (250 mL) of flour, then add it gradually until you get the desired texture. Add as little flour as possible to the kneading surface. Use a pastry scraper as you knead the dough to pick up any bits that stick to the surface. The dough should still be slightly sticky when fully kneaded— it may be a little harder to work but will give you the desired results. 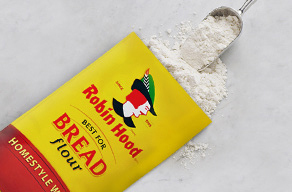 It’s best to use flour specially formulated for baking bread, like Robin Hood® Best for Bread flours. 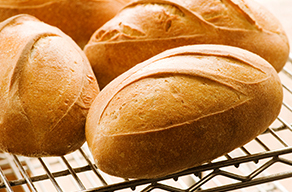 It will help you make delicious breads that are high in volume with a light, even texture. At the minimum, you want High Grade Flour (not plain flour). You may also find flours that are called ‘Strong Flour’ or which say that they have extra gluten added for breadmaking. 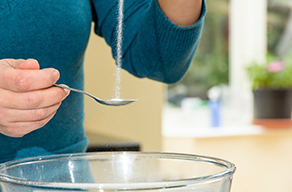 Salt enhances taste, and helps bring out the flavours and aromas of the ingredients in your baked goods. Salt will help with tightening the gluten structure, which strengthens the bread dough, and helps with the volume of the bread in the end. Yeast feeds on sugar, which causes it to activate and produce carbon dioxide gas. 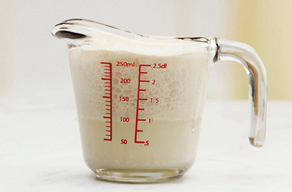 Be sure to follow the recipe, as adding too much sugar can slow down your yeast or keep it from activating. Fats like butter, shortening and oil help to lubricate the dough and allow it to stretch, making your loaf tender. When using active dry yeast, it’s important to make sure it’s still viable. Always follow the recipe directions, which will include dissolving a specified amount of sugar into lukewarm water (110ºF-115ºF/45ºC-56ºC). Then add the yeast and allow it to stand for 10 minutes. If the yeast bubbles up, it’s still active. If not, your bread or rolls will not rise. Be sure the water is lukewarm. If the water exceeds 138°F (59°C), the yeast will become inactive. Kneading helps to develop gluten in the bread. Knead dough on a lightly floured work surface, adding more flour if dough is too sticky. 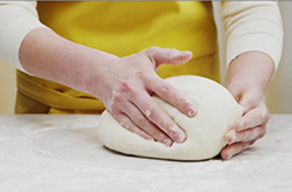 You’ll know kneading is complete when the bread is smooth and elastic. To test it, lightly slap the dough. If your hand comes away clean, it’s ready to rise. When you let the dough rise, the ingredients activate and carbon dioxide develops causing the gluten to stretch. It will rise best in a warm place (75°F-85°F / 24°C-29°C) that is free from drafts. Make sure you place it in a greased bowl that’s large enough to allow the dough to double in size. Cover the bowl with a tea towel.Once it’s doubled in size and no longer springs back when pressed, lightly punch down the dough and let it rest for 10 minutes to relax the gluten. Once your dough is placed in or on its pan, it’s ready to rise again in a warm place (75°F-85°F / 24°C-29°C). Let your dough rise until it is again double in size. If dough overrises, it may collapse in the oven during baking. If you don’t have a place in your home that’s warm enough, try leaving it in the oven with the oven light turned on. If you like, you can also add a pot of hot water on another rack. Letting the dough rise twice helps improve the flavour and texture even more. Just finished making your bread dough but need to step away? Place your dough in the refrigerator for the first rising. This slows down the rising as yeast doesn’t like the cold. You can let the dough sit in the refrigerator overnight. When you’re ready to make the bread, take the dough out of the refrigerator, punch it down, shape the dough and let it rise a second time. Since the dough is cold, it will take longer than normal to rise. 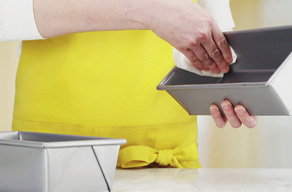 To eliminate large air bubbles, roll out your dough into a large rectangle (approx. 9” x 12” / 23cm x 30cm). From the shorter end, roll it up jelly-roll style, sealing the dough in the middle with the heel of your hand after each turn. For a different look, bake your loaves free-form on a baking sheet that’s greased or sprinkled with cornmeal. Cornmeal will prevent bread from sticking and provide an interesting texture to the bread. 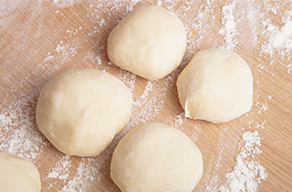 Use a sharp knife or kitchen shears when a recipe calls for dividing the dough in half or making into rolls. 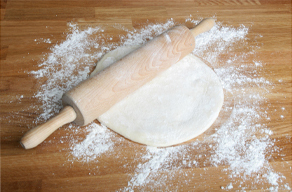 If you tear the dough it may compromise the gluten, which will affect the rising and shape of the end product. Love homemade bread but don’t want to have to make the dough all the time? Plan ahead and freeze some dough. Use your favourite bread dough recipe but double the amount of yeast called for. Follow the recipe for the mixing, kneading and the first rising. 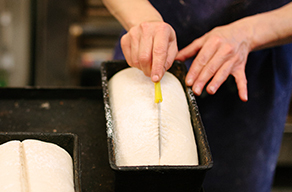 Punch down the dough, shape into loaves that are 2” (5 cm) thick (this allows for quicker thawing). Place in air tight freezer bag and freeze for up to four weeks. When you’re ready to bake, remove the dough from freezer bag, place it in a greased loaf pan, and cover with greased plastic wrap. The dough will rise as it defrosts. Once thawed, follow your recipe’s baking directions. 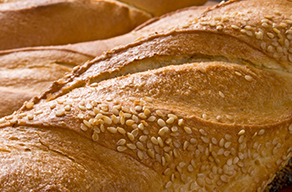 Glazes may be used to provide different results in the bread crust. 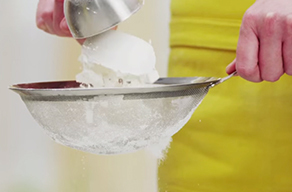 For a crisp crust, brush the dough with a mixture of one egg white and ½ tsp (2 mL) water. For a shiny, golden crust, use a whole egg beaten with 1 tsp (5 mL) water. If you’d like a deep brown crust, use egg yolks instead of egg whites. If you brush the dough with melted butter or oil, it will produce a soft velvety crust. 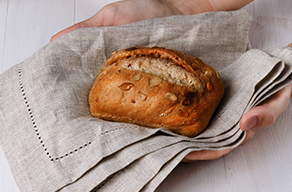 If you want to top your bread with nuts, seeds or grains, make sure to brush the dough with the glaze first, so it acts like a glue. Dough that is made with water will typically have a crispier crust, while dough made with milk will be softer. To soften a crisp crust, brush it with melted butter as soon as it comes out of the oven. For a darker, richer colour, brush the finished loaves lightly with butter and return them to the oven for 5 to 10 minutes. To get a crisp baguette type crust, you have to create a steam environment in your oven. Using a spray bottle, spray water on the sides of the oven every 10 minutes while the bread is baking. You can also put a pan of boiling water on the bottom rack of the oven under the bread. 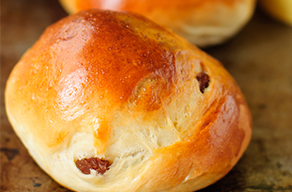 Take your favourite bread dough and change it up by adding nuts, cheese, dried fruit or chopped chocolate. To make a savory dinner bread, you can also add chopped garlic and herbs. 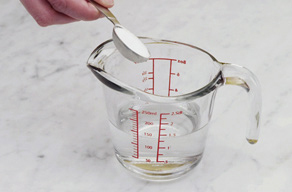 Use shortening or oil, like Crisco®, butter, or non-stick spray to grease the pan. Unless the recipe says otherwise, always bake your bread on a lower rack. If you’re baking more than one pan, be sure they are not touching one another or any sides of the oven. You want the air to circulate between them so they cook evenly. If your crust is becoming too brown too quickly, cover it loosely with aluminum foil. HOW DO I KNOW WHEN MY BREAD IS BAKED? Similar to checking the doneness of other baked goods, you can insert a skewer or cake tester into middle of bread. If it comes out clean, it is ready. An instant read thermometer is a very reliable way to check as well. 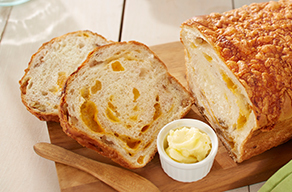 Insert the thermometer in the center of the loaf – if the temperature has reached 190°F/88°C, it is ready. 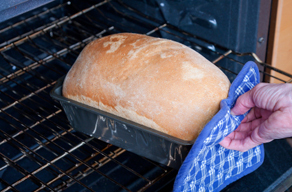 Remove the baked bread from the pan immediately and place on a wire cooling rack to cool. This allows the air to circulate and prevents the crust from becoming soggy. WHY IS MY BREAD TOO SMALL? Make sure your oven is at the right temperature. If it’s too hot, the bread may bake too quickly, causing a crust to form before the bread is finished rising in the oven. Also make sure that your bread dough isn’t too cold. 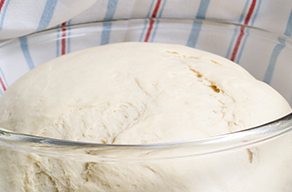 Make sure your bread dough has risen in a warm place (between 75°to 85°F/24° to 29°C). 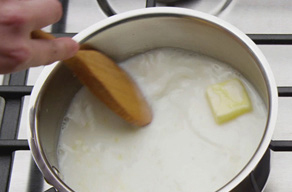 When baking, leave a space between your pans so they are not touching in the oven, allowing for proper air circulation. WHY IS MY BREAD COARSE AND CRUMBLY? 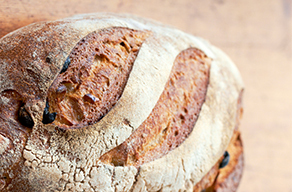 If your bread is coarse and crumbly, you may have let your dough over rise or you may have over kneaded the dough. Make sure you follow the recipe directions and allow the dough to rise just until it is double in size – this should take about 1 hour. Knead your dough for the specified time only. 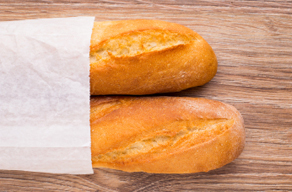 To keep your crust crisp, store your bread in a paper bag at room temperature. It should be good for up to two days. If storing bread at room temperature, avoid storing it in plastic wrap unless you want an especially soft crust. Bread is best stored at room temperature or frozen. Refrigeration tends to dry out bread. Bread freezes really well. 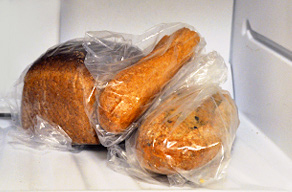 To freeze, allow your loaf to cool completely, wrap well with plastic wrap, then place in a freezer bag. Be sure to remove all the air or ice crystals will form while freezing. Thaw at room temperature in the freezer bag to allow the bread to re-absorb the moisture lost during the freezing process. To freshen your loaf, place it in a 350°F (180°C) oven for 10-15 minutes. What great information- nothing better than fresh bread.